In the PS4 adventure Spyro the Dragon (Spyro Reignited Trilogy) you can unlock a total of 37 trophies. In this Trophy Guide we show you all the trophies and their tasks. 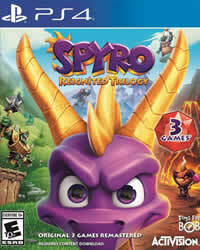 More Guides and News about Spyro the Dragon you will find on our overview page. You dident find all the Supercharge Ramp Jumps? No problem, here we show you all locations. Night Flight, the Peace Keepers speedway level, there are fairies that act as a guide to let you know where you need to go while collecting all sets. When approaching, press circle for flames. Do that with all fairies in the level to unlock this trophy. When you reach the end of Alpine Ridge, you must fly to a hidden cave to rescue the dragon Kelvin. Instead of going into the cave, continue straight ahead and you will come to a pillar with an explosive chest. Use your flames on the chest. Do the same for the remaining two and you will unlock this trophy. In Wizard Peak there is a hidden Egg Thief. You find him on a platform that is quite far away, you have to use Supercharge. If you saved Jarvis, use Supercharge, turn left and then go straight through the blue wizards. Time your jump and you land on a platform with a blue and yellow box. Behind the wall is the egg thief. Use your flame to unlock this trophy. You can not find all the mushrooms? Here we have all the locations for you . If you have rescued 10 dragons in Artisan World, you can visit Marco, the balloonist of Artisan World. You can find him at the docks. In Artisan Home World there is hidden access to a speedway level, Sunny Flight. To unlock the trophy, jump on all the stones in the pond by the waterfall. In Dark Hollow, halfway through the level, there are two bonfires. You will find both near a staircase with red gems. Ignite both fires to unlock the trophy. For this task you need precision and timing. There are cannons in the world of Peace Keepers Home. You can unlock this trophy with any cannon. Once you have defeated one of the Gnorcs who occupy a cannon, aim for one of the Moon Gnomes. You can do this in High Caves of Magic Crafters. You can find all the details right here. This task can be done in Terrace Village. After rescuing Claude, you'll see a rocket on the right. Rockets are used to break off chests that the Spyro can neither flame or charge. For this trophy, this rocket is NOT lit yet. Instead, go through the level and at some point you will reach two other rockets, which are close together.Here you will find a full walkthrough about this task.